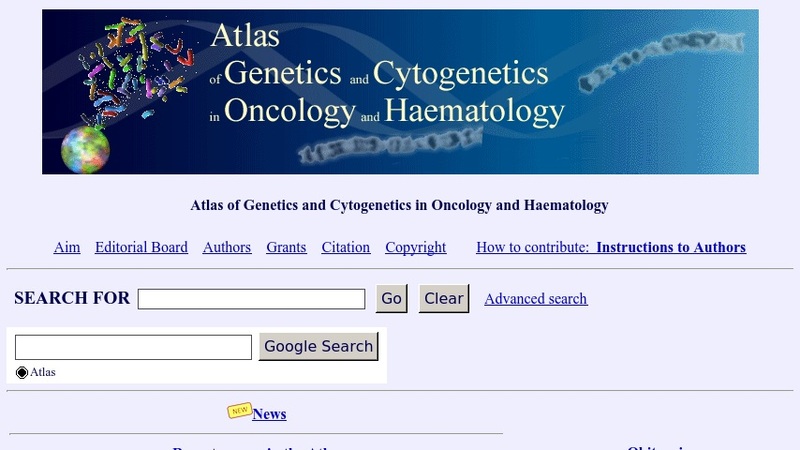 The Atlas of Genetics and Cytogenetics in Oncology and Haematology, a peer-reviewed online journal and database provided by Infobiogen, is "devoted to genes, cytogenetics, and clinical entities in cancer, and cancer-prone diseases." Users can search the materials by genes, leukaemias, solid tumors, cancer prone diseases, and chromosomes. Researchers can find links to scientific societies and meetings. Students can explore educational materials on Mendelian and non-Mendelian Inheritance, chromosomes, population genetics, and additional human genetics topics. The website also offers reviews and case reports.